The end of WWII had left the United States and the Soviet Union as the two global superpowers, and Korea, a Japanese protectorate, was far down their respective lists of priorities. Pre-occupied with imposing control on Eastern Europe, the Soviet Union simply wanted to ensure that Americans troops were not stationed near its borders, so the 38th Parallel was selected as the dividing line between the Russian and American occupation forces. The support of the American occupation forces ensured that American-educated Syngman Rhee was elected president of the Republic of Korea (ROK). Kim Sung-il, who had served with the Red Army during WWII, became the Soviets’ candidate in North Korea. Both Rhee and Kim wanted to reunify Korea by force and believed that the other side would fall easily. Aware that Rhee would provoke a war if permitted, the United States refused to provide the ROK army with planes and tanks. However, Stalin approved Kim’s invasion plan, supplying the North Koreans with generous quantities of planes and tanks. When the North Korean People’s Army (NKPA) crossed the border on June 25, 1950, its large, well-trained army steamrolled through the unprepared ROK forces. Believing that remaining neutral would be interpreted as weakness by the Soviets, President Harry Truman won the support of the United Nations (UN) for the defense of South Korea, assigning the military response to General Douglas MacArthur, commander of the American occupation forces in Japan. American reinforcements were sent piecemeal, so the NKPA had gained control of all of Korea except for a small perimeter around the port of Pusan by August. The NKPA had already burned itself out with repeated frontal attacks when an amphibious landing at Inchon caught the North Koreans completely by surprise. Seoul was recaptured on September 25, and the NKPA began to disintegrate. Deciding to reunify Korea by force, an overconfident MacArthur dismissed China’s warning that it would not permit American troops near the Yalu River, the border between China and North Korea. The entry of hundreds of thousands of Chinese ‘volunteers’ into Korea in late November transformed the war. After a series of Chinese offensives and American counter-offensives, the lines had stabilized near the 38th Parallel by mid-summer 1951. During a visit to a USS aircraft carrier during the Korean War, famous author James Michener is told a Christmas Story by the flight surgeon, Commander Kent Dowling (Walter Pigeon). The pilots on the carrier are tired of repeatedly bombing the same target, the trainyard at Wonsan, and lack enthusiasm for the mission because they don’t understand why they are fighting a war that is called a police action. Furthermore, several pilots resent the aggressive nature of the flight leader, Lieutenant Commander Paul Grayson (Frank Lovejoy), who seems willing to risk both his life and their lives since the trainyard is operating normally the next day regardless of the damage caused by their bombs. In particular, the second-in-command, Lieutenant Commander Ted Dodson (Kennan Wynn), complains that Grayson takes too many risks with their lives for a war that no one cares about. Unlike the other pilots, both men had served in WWII, but Grayson is unmarried, while Dodson only wants to return to his family. After losing two ridiculously expensive planes in a short period of time, Grayson is ordered to stay higher during the bombing runs, but Dodson’s plane is damaged by anti-aircraft fire and he dies in a crash landing on the carrier. Finally, the squadron is allowed to hit targets of opportunity after the trainyard, so they hit roads and bridges. When Ensign Kenneth Schechter (Dewey Martin) is hit and blinded during a raid, Lieutenant Howard Thayer (Van Johnson) has to guide him to safely land on the carrier because his eject mechanism is broken. Since the incident happened on Christmas, it becomes their Christmas story. Early in the film, the flight surgeon explains that the pilots don’t know why they are risking their lives since it is a police action, not a war. I understand their confusion since neither China nor Korea, north or south, are mentioned, although there is a brief reference to the Commies. 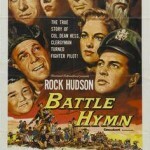 Since the movie was made in 1954, viewers knew that the film took place during the Korean War, but it seems that someone could have made an attempt to explain the war. Even the commanding officer of the carrier seems disillusioned. While giving Michener a tour, he explains that the new planes are much more powerful than the planes in WWII, while commenting that the bombs cost more than the targets. A lengthy scene pays tribute to the bravery of the rescue chopper crew. During one mission, Grayson is hit and has to eject in the sea. Despite the quick reaction of the rescue chopper crew, he is too frozen to put the sling on himself, so the crewman has to jump in, put the sling on him, and wait for the chopper to fly to the carrier and back, hopefully within twenty minutes or he will freeze to death. The incident related during the Christmas Story did take place, although the blinded pilot landed at an airfield, not on the carrier. Presumably, the landing was changed to their carrier for dramatic purposes. The script is based on an article that James Michener had written for the The Saturday Evening Post. Michener had met the men and observed the rescues when he stayed on the carriers Essex and Valley Forge while they were performing missions off the coast of Korea, as research for a series of articles for the magazine. The film is similar to The Bridges at Toko-ri (1954) but without the charm and the honest disillusionment. 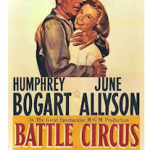 The two films share much in common including the respectful presentation of the dangers of air rescue and the frustration of married veterans of WWII called back into service. 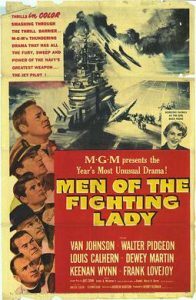 However, Men of the Fighting Lady is filmed like a documentary, and appears to be intentionally boring. Honestly, no one seems human, except possibly the head mechanic Lieutenant Andrew Szymanski (Bert Freed), who grimaces with each bad landing, and takes the damage to each plane seriously. To be fair, it is an effective documentary, and the planes are beautiful. The script makes up for the lack of human character with even more technical detail. 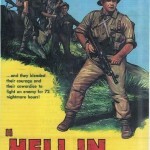 The bombing scenes use stock footage from the Korean War, which gives the film an authentic feel. Part of the action scenes are filmed from the pilot’s perspective, showing that they can barely pull up in time. The aerial scenes are great, as is the scene where the deck is cleared for an emergency landing. I admit that I cringed as I watched the metal slowly peeling off Dodson’s wing shortly before his crash. In the end, impressive technical detail does not compensate for robotic acting. Let's Go With Pancho Villa!